Football needs to lighten up and learn from the casual attitude of the American golfer. 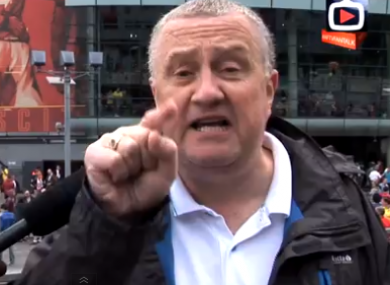 This angry Arsenal fan last week became a YouTube sensation. Football was invented by privileged Victorian gadabouts as a means of passing the time agreeably when all the opium had run out. In the modern world, however, the game’s ability to bring fun and pleasure appears lost. The bottom half of the internet gets a lot of flak for this sorry state of affairs, with all the pious hand wringing, petty jealousies, and free-jazz approach to thinking arguments through. Although if we are being honest, the stuff written above the line does not help much either, with all the pious hand wringing, petty jealousies, and free-jazz approach to thinking arguments through. When attempts are made to lighten the mood, discourse degenerates into banter, a jovial patois invented by Royal Air Force servicemen to lift the spirits during the war and honed in the 2000s by former Soccer AM presenter Tim Lovejoy into a form of humour so surface-deep it appealed to television commissioning editors. This afforded him the opportunity to build an entire career on it, the nation taking the popular entertainer to their hearts, much as they did with other beloved daytime stars such as Jeremy Kyle and Robert Kilroy-Silk. Few enjoy themselves. The biggest current YouTube sensation that is not Lil Bub, the cat who cannot close her mouth, is a manic-street-preaching Arsenal fan who has similar issues with the operational status of his maw. Big Bub delivers a lengthy and strident polemic on the state of his club, emotionally calling for the sacking of Arsène Wenger, or the sacking of whoever it is that might sack Arsène Wenger. It is very much an energy piece, the star hopping around with so much impotent rage that at one point the performance threatens to segue into contemporary dance. This carry-on has been lauded as a shining example of the people’s passion, the special stuff that fuels football. But should Arsenal losing one match to Aston Villa, a club after all with more European Cups to their name, be an event that generates this much rage? It is a question that needs asking, preferably by a medical professional with a soothing voice and several cold flannels. When did losing become, to use post-Bakerian 606-speak, totally unacceptable? Defeat used to bring its own amusements. One of the great joys of soccer, alongside deliberately irritating misinformed anti-American pedants by deploying the word soccer, is the quiet trudge homeward following a five-goal reverse, via a pub where pints are stared at in silence for 45 minutes, untouched, before low sighs of “I knew it” ascend into a reverie of resigned moaning. But there will have been no such soothing early-evening catharsis for Big Bub! The needlessly intense attitude of the professionals is not helping anyone retain perspective. The highly strung Sunderland manager, Paolo Di Canio, spent the run-up to the new season zig-zagging around with a face on, looking for things to ban as part of his in-no-way-dubious-sounding Complete Revolution. This cheery 1930s mindset cannot be healthy. He has threatened to fling all of his squad’s mobile phones into the North Sea, a promise with uncanny echoes of another manic character from the north east, Michael from I’m Alan Partridge, who once dispatched a monkey into the briny in the throes of a thundering nervous breakdown. Michael was last seen in the Partridge movie Alpha Papa, living in a cupboard and defecating into his lunchbox. The janitor at Sunderland should do a thorough sweep of the Stadium of Light every evening, just in case. Di Canio has also banned ketchup, mayonnaise, Coca-Cola, and other items commonly associated with “American fast-food chains”, in the hope of turning his pleasure-deprived players into serious high-performance machines who might one day score a goal. Does a squeeze of Heinz really make that much difference? Good luck watching the lads go about their bloodless business, Sunderland fans! God speed! It would be lovely to know what this frowning menace thinks of Jason “The Somnambulist” Dufner who, despite subsisting on a diet of beef, cake and chewing tobacco has, if his heavy-lidded insouciance is any guide, a resting pulse of 12. The new PGA champion has revealed that he celebrated his recent win by filling up the Wanamaker Trophy, possibly the largest pot in professional sport, with a late-night order of 49¢ tacos from Taco Bell – before getting up for a hearty breakfast of grits. The sports scientists will trot out the lame canard that golf is not sport, arguing Dufner is the exception proving the rule, nothing more than an enigma wrapped in a tortilla with extra cheese. Yet surely in his blithe indifference lies the key to a better world. He is the one enjoying success, free of angst and strife; whose devoted legion of fans, win or lose, go home happy; who is tucking into a pyramid of fried meat and mayo washed down with full-fat pop. The Dufner Plan’s working, people, and it is the healthier option. Football should give it a whirl, and to hell with it if the midfield pressing loses some intensity. So quit staring, Paolo, and pull up a chair. Life is too short, and these burritos are excellent. Email “Opinion: Why football fans should take a leaf out of Jason Dufner's book”. Feedback on “Opinion: Why football fans should take a leaf out of Jason Dufner's book”.